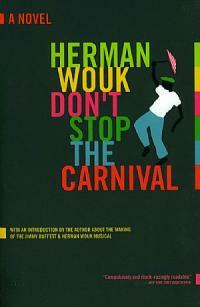 Don't Stop The Carnival is a hilarious and heartbreaking novel about retreating from the madness of modern life and escaping to a tropical paradise. Inspired in part by Herman Wouk's own experience of living for seven years on an island in the sun, the novel tells the story of Norman Paperman, a New York City press agent who, facing the onset of middle age, runs away to a Caribbean island to reinvent himself as a hotel keeper. Zany mishaps, illicit love, hilarity, and disaster (of a sort particular to the tropics) ensue.